Where I come from, the X-23 is a bus that’ll take you to the arse end of the Valleys in Wales, but if you‘re a Marvel fan then you will know that X-23 is the original moniker given to Laura Kinney, the second Wolverine who was cloned from the original and eventually the adopted daughter of Logan. But that was then. Family Album sort of hits the reset button on Laura’s timeline. Taking her back to her roots after a stint with the X-Men, albeit with a bit of a character lobotomy, Kinney opts to look after her cloned “sister” and protect her from the nightmares she herself endured. But as ever, trouble isn’t far behind as they are pursued by a powerful group of psychics, with the fantastic name of The Stepford Cuckoos who are intent on capturing the sisters. 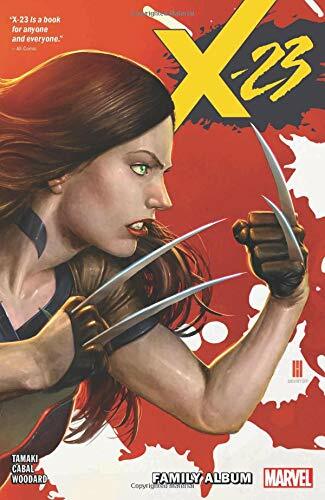 Aside from the main story arc, there are the usual sub plots, this time involving those X-Men that don’t always walk the straight and narrow, who would also do the powerful sisters harm but if you are familiar with X-23, then her new softer character may come as a surprise to you. I think that ultimately we will see her revert to her darker former self, as I think that this is just a case of her showing her paternal instinct towards her sister Gabby, a side of Kinney we’ve not seen before. But blood runs deep, even cloned blood.